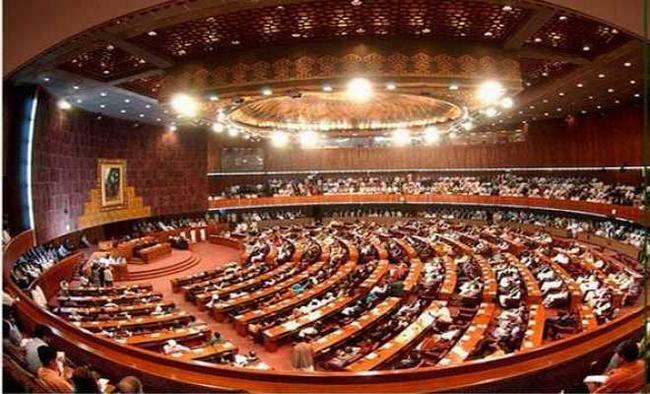 Islamabad: The inaugural session of Pakistan's 15th National Assembly (NA) was underway here on Monday during which 331 members of the Lower House of Parliament took oath after their election in the July 25 general elections.Outgoing NA Speaker Ayaz Sadiq administered the oath to the members in the 342-member house, reports Dawn news. Prime Minister-in-waiting and Pakistan Tehreek-i-Insaf (PTI) chairman Imran Khan and other prominent political leaders, including Pakistan Muslim League-Nawaz (PML-N) President Shahbaz Sharif, Pakistan People's Party (PPP) chairman Bilawal Bhutto-Zardari and former President Asif Ali Zardari, were present in the assembly for the oath-taking.Television footage showed the PTI chief shaking hands with Bilawal, who is entering the NA for his maiden term. After administering the oath to the MNAs, the Speaker will prorogue the NA session until August 15, when the new speaker and deputy speaker of the assembly will be elected. The nomination papers for the same will be submitted on Tuesday.Sessions are also set to begin in the provincial assemblies of Sindh, Khyber Pakhtunkhwa and Balochistan for the MPAs-elect to take oath.